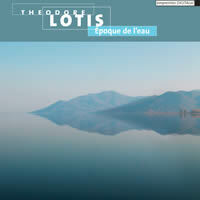 “Époque de l’eau.” Theodore LOTIS: Arioso Dolente / Beethoven Op. 110 (2002); A South Wind will Bring the Sand (2002); Underwater Theories (2002); Sibylla’s Voice (2001); Shadows (2000); La mer (1996). empreintes DIGITALes IMED 0894 (1 CD) (http://www.empreintesdigitales.com/). Wind and water provide the background for Lotis’ dreams. Most of the music operates in the treble range and uses precisely positioned pitched sounds, rarely with noise or distortion. Beneath the gauzy surface lies a complexity not immediately apparent. Arioso Dolente / Beethoven Op. 110 eventually reveals a piano; however, the piece’s subject is Beethoven’s disposition. The sinister edge of Sibylla’s Voice occurs by way of processed violin sounds simulating the sibyls’ grim pronouncements. The recent 2002 South Wind will Bring the Sand and Underwater Theories suggest that Lotis now prefers concealing complexities under smoothly changing surfaces. Without notes or title I wouldn’t have guessed that the two-part La mer is about the sea. Lotis manipulates bee sounds to simulate water in La mer’s first movement. 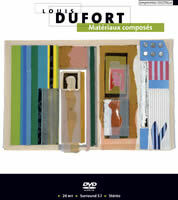 “Matériaux composés.” Louis DUFORT: Grain de sable (2004-05); Matério_ (2006)*; Enfant d’obus (2007); Matério_ (2006)**; Gen_3 (2007); Matério_ (2007)***; Hi_Res (2005). empreintes DIGITALes IMED 0893 (1 DVD-A) (http://www.empreintesdigitales.com/). Dufort’s chartered tour is more like a night drive through the bad part of town. Several pieces convert mechanical and ambient sounds into noise, as in Grain de sable’s opening and the flashes that whip through Gen_3. Enfant d’obus (“Bomb child”) conjures destruction with shattering glass and spluttering fire. Grain de sable marks the aftermath of the December 2004 tsunami that hit Thailand, with drowning as one of its themes. Dufort’s bewildering development of ideas occurs without apparent cohesion, as in the Matério_ trilogy, the parts of which appear to contemplate consistent sources — something squeaking, something dipped in water, something crunching, mechanical noises, etc. Dufort isn’t consistently apocalyptic, witness Gen_3’s humorous borrowings from, among others, Francis Dhomont, Pierre Henry and that venerably ancient, Billy Machaut. Hi_Res feels like a video game. Günther BECKER: Ferrophonie (1973)1; Aus Alpbachs Hain und Flur (1978)2; Passagen (1975-76)3. Pierre W. Feit1 (ob), Mirko Dorner1 (vlc), Alfred Alings1, Christoph Caskel3 (perc), Gisela Saur-Kontarsky3 (voice), Herbert Henck3 (pno), Raimund Juelich3 (synth), Dirk Reith1, Ferdi Brendgen1, Günther Becker1, Michael Feller2 (electronics and sound). Cybele SACD 960.401 (1 SACD) (http://www.cybele.de/). Distributed in the US by Qualiton (http://www.qualiton.com/). 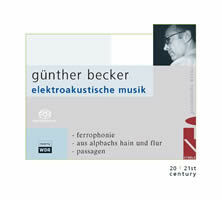 Cybele’s “Günther Becker: Collected Works” series consists in the present instance of electroacoustic music. The oldest item, Ferrophonie, documenting the April 16, 1973 realtime processing of metallic objects, presents a puzzle: While an oboist, cellist and percussionist are credited, the music sounds wholly electronic. Perhaps these instrumentalists are among the four persons who set the steel (bars, bells, chains, pipes, slinkys, etc.) in motion. Klöckner-Werke AG Duisburg, which wanted something special to accompany a Hannover tradeshow presence, commissioned Ferrophonie. Aus Alpbachs Hain und Flur (“From Alpbach’s Forests and Meadows”) is an “electronic study of winged insects (crickets, locusts)” whose title recalls a movement from Smetana’s Má vlast. As pure tape, the natural sounds compete with signals and extensive processing. Passagen (“Passages”) offers a mid-century panorama of piano-plus-percussion gestures, ring-modulated voice processing, and burbling ARP-synthesizer blips. Grammar that once seemed vital now sounds dated. To give the man his due, with respect to 1970s electronic music, Becker was a well-schooled practitioner. 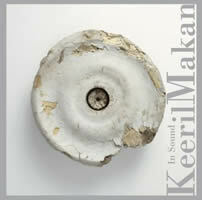 Keeril MAKAN: The Noise Between Thoughts (2003)1; Threads (2002)2; Washed by Fire (2007)3. Kronos Quartet1, 3: David Harrington, John Sherba (vlns), Hank Dutt (vla), Jeffrey Zeigler (vlc), Paul Dresher Ensemble Electro-Acoustic Band2: Karen Bentley Pollick (vln), Peter Josheff (b-clar), Paul Dresher (e-guit), Marja Mutru (keyboards), Joel Davel (marimba lumina), Gene Reffkin (e-perc). Tzadik TZ 8053 (http://www.tzadik.com/). Makan’s two string quartets operate at different extremes. The Noise Between Thoughts asks its four players to emulate electronic effects, producing gritty, non-pitched timbres. At some points, I envisioned Lachenmann’s exquisitely precise silverpoint recycled on newsprint. With its soulful pitches and a post-minimalist aesthetic of repeated passages and tricky polyrhythms — Nyman on Valium — Washed by Fire sits at the other end of the scale. Kronos is well-suited to either style. I imagine that the well-performed The Noise must have been tricky to notate. The big-band Threads blends live instruments with electronic doubles. Stylistic differences offer ample variety, and yet Makan’s “voice” remains elusive. 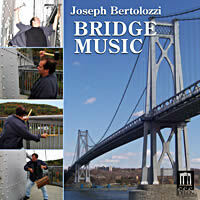 Joseph BERTOLOZZI: Bridge Music (2004-09). Delos DE 1045 (http://www.delosmusic.com/). Distributed in the US by Naxos (http://www.naxos.com/). Bridge Music is precisely as advertised, music built by thwacking a bridge, in this case, the Mid-Hudson Bridge. None of the sounds are manipulated, suggesting that a live performance is possible on the span itself. A bonus-track audio tour gives names and locations to many of the sounds, revealing Bertolozzi’s inventiveness within this narrow gamut. Some combinations sound like a pinball machine making its way through a Harry Partch invention. It’s possible to visit the bridge and hear the music at designated listening stations. Who would have believed that Ralph Modjeski, a Paderewski classmate, designed this structure! I see this release as a natural here. 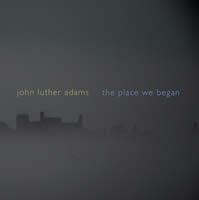 “The Place We Began.” John Luther ADAMS: In a Room (2008); At the Still Point (2008); In the Rain (2008); The Place We Began (2008). Cold Blue CB0032 (http://www.coldbluemusic.com/). These four pieces unfold as a symphony of atmospherically layered sine waves enriched with humming partials. A first listen puts this among the minimalists. Particulars include subtle rapid electronic pattering or natural sounds, e.g., In the Rain. Subsequent spins reveal subtle transformations. The briefest notes indicate that these pieces are based on reel-to-reel tapes Adams unearthed in his studio. Certainly The Place We Began suggests a retrospective; however, there’s little evidence of nostalgia or sentimentality. Indeed, the ambivalent mood suggests stuff that’s fallen between the bed and the wall. 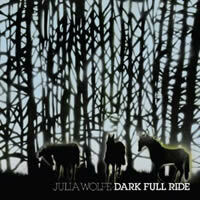 “Dark Full Ride.” Julia WOLFE: LAD (2007)1; Dark Full Ride (2002)2; my lips from speaking (1993)3; Stronghold (2008)4. Matthew Welch1 (bagpipes), Talujon Percussion Quartet2, Lisa Moore3 (pno), Robert Black4 (bass). Cantaloupe Music CA21058 (http://www.cantaloupemusic.com/). “Music in Multiples” features works for four homophonic ensembles: nine bagpipes, four drum sets, six pianos, and eight double basses. A percussion quartet performs Dark Full Ride. The other pieces are multi-tracked productions. Each explores limited material despite the multiple players. LAD sounds like what you’d imagine nine bagpipes to sound like. Its first part avoids melody, the second finds a tune. Dark Full Ride opens with sizzling hi-hat. When the thumping drums arrive, the music disdains an easy beat. My lips from speaking collects blues cadences and gathers them into a maelstrom. Stronghold swirls an expanse of string basses over gradually shifting chords. 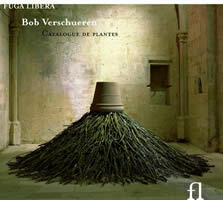 Bob VERSCHUEREN: Catalogue de plantes (Var. comps 1995-2008). Fuga Libera FUG705 (http://www.fugalibera.com/). Distributed in the US by Allegro Music (http://www.allegro-music.com/). Photos of Verschueren’s visuals — arrangements of sticks and vegetation — decorate this release. Over the years he has also constructed musique concrète with plants. Who would have thought that vegetation offers such sounding variety? Not knowing the sources, you might well think that these are small objects, possibly seeds, being rattled or in some way manipulated. Certain plants squeak, chirp, and whine. Even with full knowledge of the project, you may need to research the 16 French and Latin track names. Céleri (Apium graveolens) contains snapping, crackling, rustling foliage, not to neglect rattling seeds. With its avionic-like noises, Maïs (Zea mays) is the longest movement. A sample score page looks very much like the photos of arranged twigs. Intriguing, clever concrète. A quirky classic. 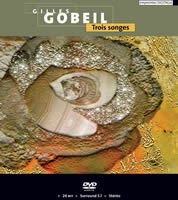 “Trois songes.” Gilles GOBEIL: Ombres, espaces, silences… (2005); Entre les deux rives du printemps (2006); Le miroir triste (2007). IMED 0892 (1 DVD-A) (http://www.empreintesdigitales.com/).